This Saturday, Sept. 26, Special Olympics hosts a fundraising event at the Fremont Theater where the Back to the Future trilogy will be screened in its entirety beginning at 4 p.m. Doc Brown’s DeLorean time machine will also be on display. TIME MACHINE! : Doc Brown’s 1985 DeLorean time machine will be on display at the Fremont Theater when all three Back to the Future films are screened on Sept. 26 during a Special Olympics fundraising event. In 1985, co-writer and director Robert Zemeckis (Forest Gump) and executive producer Steven Spielberg (Saving Private Ryan) teamed up to bring Back to the Future to the big screen. It earned $383 million worldwide, making it the highest-grossing film of the year, spent 11 weeks at No. 1, and raked in a raft of awards. The mind-bending plot revolves around Marty McFly (Michael J. Fox), who accidently travels 30 years back in time to 1955 in his friend Doc Brown’s (Christopher Lloyd) 1985 DeLorean time machine. 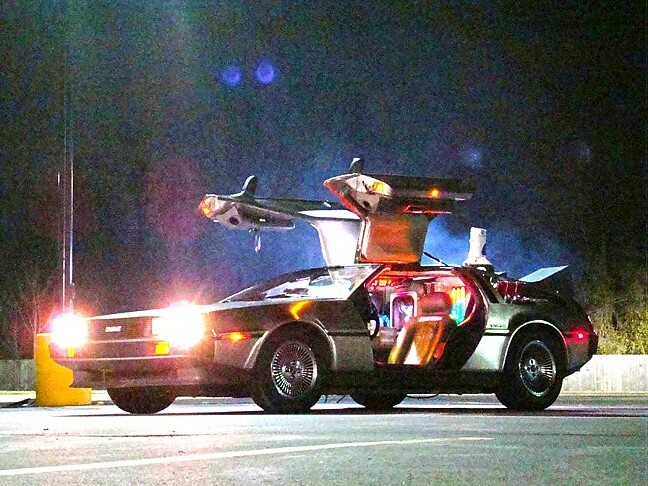 You see, Marty meets Doc late one night in a mall parking lot to see him test the machine, with a “flux capacitor” powered by plutonium Doc stole from Libyan terrorists. But before Doc can test the machine, the Libyans appear and gun him down, and Marty, in his attempt to escape, jumps in the time machine and ends up in the past. Marty meets his future father, George McFly (Crispin Glover), whom he saves from an oncoming car, which instead knocks Marty unconscious. When he comes to, he’s being tended to by his future mother, Lorraine (Lea Thompson), who becomes infatuated with Marty instead of George, who would have been hit. Now that Marty has interfered with the past, the future has potentially been altered, so Marty goes in search of the 30-year-younger Doc to figure out how to get Marty’s parents together and send Marty back to the future. GREAT SCOTT! : Dr. Emmett Brown (Christopher Lloyd, left) and Marty McFly (Michael J. Fox) work together to send Marty 30 years in the past to make sure his parents meet in high school and fall in love, in Back to the Future. One of the reasons the films were so successful is their inventive and intelligent exploration of time travel conundrums. If Marty has prevented his parents’ romance by traveling back in time, he’ll cease to exist, and indeed, he sees his image fading away on a family photo. But if he ceases to exist, he can’t have gone back in time and disrupted his future. 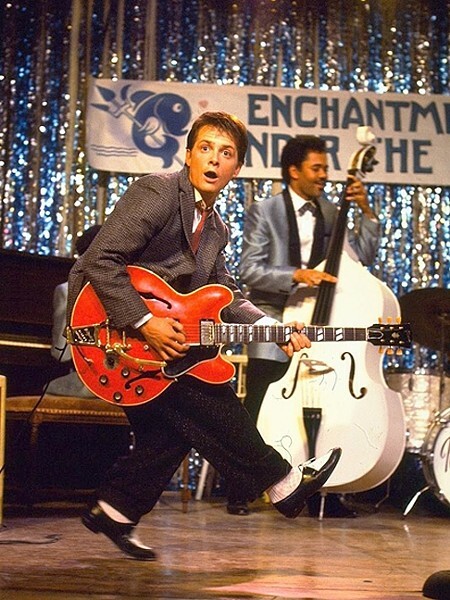 JOHNNY B. GOODE! : Marty McFly (Michael J. Fox) “invents” rock ’n’ roll when he travels back in time and plays a dance at his parents’ high school. The two subsequent sequels continue to follow Marty and Doc’s adventures. 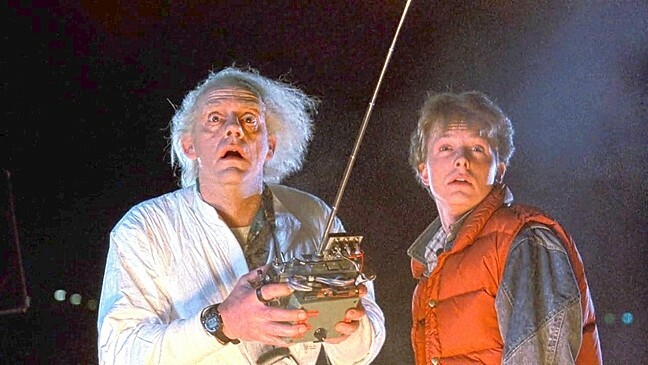 In part II, they travel into the future to 2015, an alternative 1985, and a 1955 where Marty must repair the future while avoiding himself from the original film. In part III, Marty travels back to 1885 to rescue a time-stranded Doc. All three films are a hoot, and Special Olympics is a great cause. Whether you’re seeing the films for the umpteenth time or bringing your kids for their first Back to the Future experience, there’s no place better than the big screen at the Fremont to witness the fun. TRILOGY TIME! : All three 'Back to the Future' films will be screened at the Fremont Theater on Saturday, Sept. 26, with doors opening at 3:30 p.m. and films beginning at 4. Doc Brown’s DeLorean time machine will also be on display, courtesy of docbrownstimemachinerental.com. Tickets—available online at www.sosc.org/backtothefuture—are $20 and include all three movies and a small popcorn. This event benefits the Special Olympics. Oh yeah, the films are rated PG. Glen Starkey takes a beating and keeps on bleating. Keep up with him via twitter at twitter.com/glenstarkey, friend him at facebook.com/glenstarkey, or contact him at gstarkey@newtimesslo.com.